XpressME Integration Kit doesn’t function only by it as XOOPS module. Being able to integrate by this is WordPress version 2.7 or higher. XPressME Integration Kit is downloaded on the download page. The composition of the downloaded file is as follows. 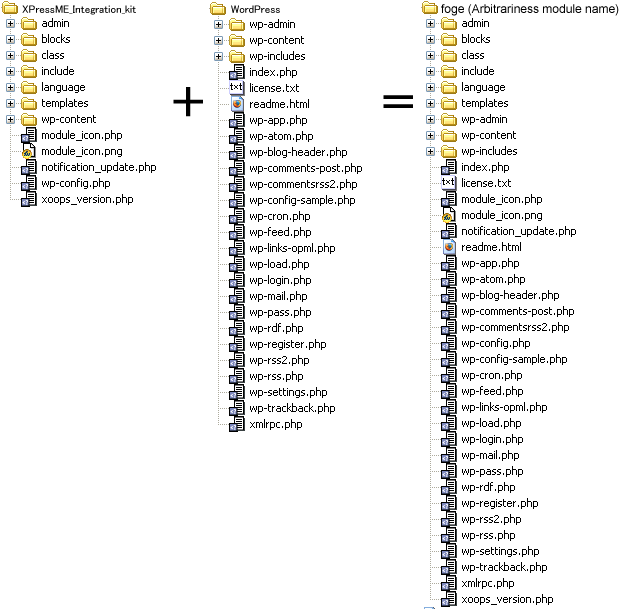 The composition of the downloaded file is as follows for WordPress2.7. The work directory is made. The directory name is made the module name such as ‘xpress’. Only “Alphanumeric character” and “Underscore ( _ )” : can be used. The file of XPressME Integration Kit is copied onto the work directory of step 1. The file of WordPress is copied onto the work directory of step 1. 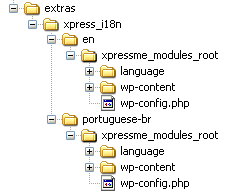 The file and the folder in extras/xpress_i18n/en(or other)/xpressme_modules_root are overwrited to the route of the module. The made module is used. Up-loads it in the directory ‘XOOPS_ROOT_PATH/modules/’ as well as other modules. The permission of /templates directory and the /wp-contents directory of the XPressME module is changed to 777. The module is installed on the XOOPS admin page. 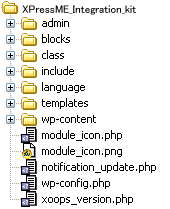 The module name (directory name) can give an arbitrary name as long as it doesn’t overlap with other modules of XOOPS.